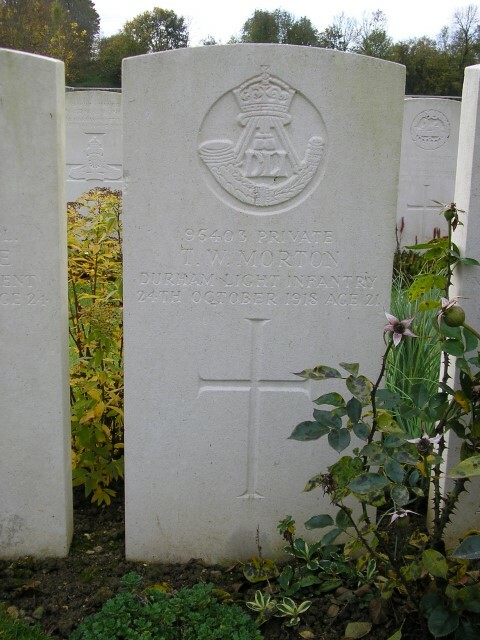 95403 Private Thomas William Morton, 2nd Battalion, the Durham Light Infantry died of wounds 24 October 1918 and is buried in Vadencourt British Cemetery, Maissemy, France. He was 21 years old and is commemorated on Woodland War Memorial and on the memorial plaque in St. John the Evangelist Church, Lynesack. In 1901, the family lived next to Harrison House on the Main Road, Woodland. 30 year old Thomas was a checkweighman at the colliery. By 1911, the family lived at Black Horse Terrace, Woodland and Thomas still was employed as a checkweighman. All of the children were either at school or under school age. 14 year old oldest son, Thomas William was still at school. Mary Ann Elliot, Thomas’ 69 year old widowed mother-in-law lived with them. By February 1915, the family lived at Prairie House, Woodland and 19 year old Thomas worked as a coal miner (putter). Private T.W. Morton died of wounds 24 October 1918. After the Second Battle of Cambrai, the Allies continued their advance recapturing French villages one by one as the German forces retreated to the north-east. The retreating Germans had hastily dug-in immediately to the east of the Rover Selle. Haig initiated a series of operations designed to get the British troops in strength across the river and clear a way for a move against the Sambre-Oise Canal, 5 miles to the east. 17 October: 5.20am after a 6 day halt for preparations and artillery bombardments the Fourth Army troops attacked in thick mist. Infantry and tanks, preceded by a creeping barrage, moved forward on a 10 mile front south of Le Cateau. Fighting was particularly fierce along the line of Le Cateau – Wassigny railway. The right of the attack across the upland watershed of the Selle made most progress and by nightfall enemy defences had been broken and Le Cateau captured. 18 & 19 October: severe fighting continued by which time the Fourth Army assisted by the French First Army had advanced over 5 miles, having the enemy back towards the Sambre-Oise Canal. 20 October: the Third and First British Armies maintained the offensive to the north of the Fourth Army. In the early morning Third Army formations secured the high ground east of the Selle. 23 October: following a 2 day pause to bring up heavy artillery, the attack was renewed with a major combined assault and the fighting continued into the next day with further gains. The battle constituted a highly significant British victory, considerable advances were made and over 20,000 prisoners were taken. 23 October: 2.15am German bombardment around the village of La Jonquiere where the battalion was forming up caused many casualties and disorganisation among the leading companies. The attack – 2 Brigade on the right; 18 Brigade in the centre and 71 Brigade on the left. In 18 Brigade, 2/DLI on the right; 1/West Yorkshires on the left and 11/Essex Regiment in reserve. 2/DLI had “C” Company on the right front, “D” Company on the left, “B” Company in support and “A” Company in reserve. As a result of the German barrage, “B” Company reinforced “C” Company. The British artillery was answered by German gunners and the counter barrage caused heavy casualties in the leading companies, both company commanders were wounded. The advance was slow but the attacking platoons advanced in small parties up the forward slope between the St. Maurier River and the Catillon-Baseux Road. They were held up by machine gun and rifle fire from houses on the right. Capt. W. Frith and a platoon serjeant knocked out 2 machine gun posts which were causing problems firing from the flank into the left rear. These should have been dealt with by 1/WYR. The leading companies, “B” “C” and “D” Companies consisted of small parties of men, some under the command of officers, some under NCOs and some led by privates showing a lot of initiative. Most parties moved to their right and were being held up by another machine gun post. “A” Company was ordered to deal with it and successfully did so, capturing Gibremont Farm. 24 October: the battalion reorganised and managed to get in touch with 2 Brigade on the right and the West Yorkshires on the left. “C” Company was in support and “D” Company in reserve. Patrols were pushed forward to Malmaison Farm. 25 October: Patrolling continued and a post was set up at Le Gard Station. Private T.W. Morton died of wounds 24 October 1918. It seems likely that he was wounded in action the previous day. Private T.W. Morton was awarded the British War and Victory medals. This was to be the last action before the Armistice. 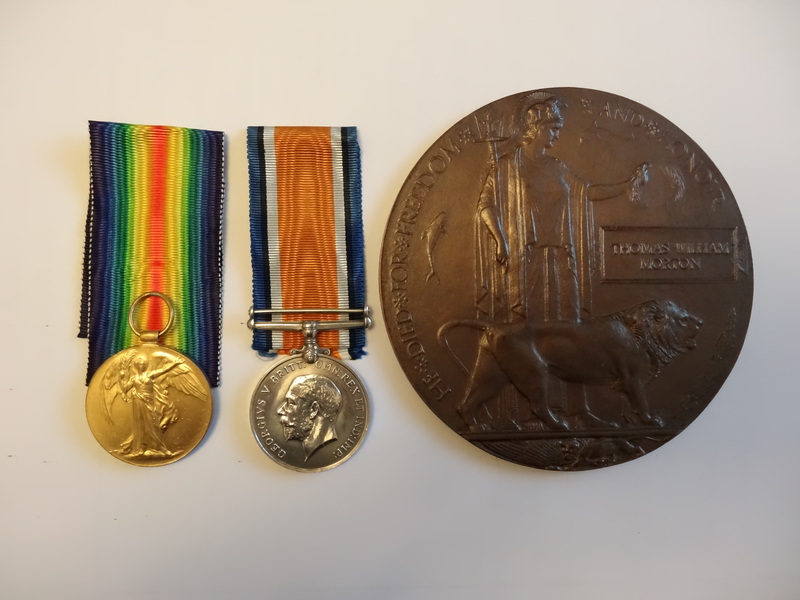 Later research records that 34 other ranks serving with 2/DLI were killed in action or died of wounds between 23 and 28 October 1918, 22 were lost 23 October.